Today there are 2 new foreclosures in the Dyersburg area. The first one is actually in Newbern at 900 Granite Drive. It is listed by Landford Realty for $85,900. It is a 3 bedroom 2 bath with a one car garage. The picture of it is up above. The other foreclosure is a HomePath(Fannie Mae foreclosure) out from Newbern near Tatumville. 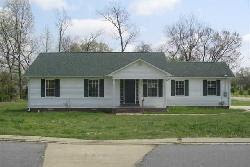 It is priced at 88,500 and more information is available under the link on the right titled Fannie Mae foreclosures. To see either of these properties or to bid on either one please call or text me at 731-589-7841.